CCI's classic Blazer load is a perfect choice for training and competition due to its inexpensive pricing and reliable functionality. 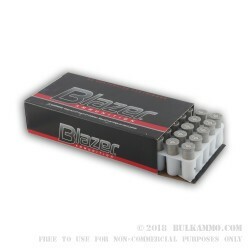 Blazer ammunition is manufactured using non-reloadable aluminum casings fitted with clean-igniting Berdan primers; this component choice means that the rounds can't be reloaded, but offer and overall lower cost for range time. This particular .38 Special load follows a classic design with a 148-grain hollow-base wadcutter projectile loaded into the case. 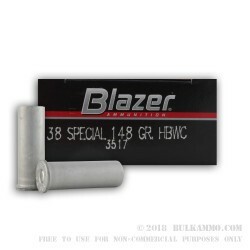 Full wadcutter bullets are cylindrical do not protrude above the case mouth, leaving less room for a powder charge which results in softer recoil for competitive purposes and new shooters. 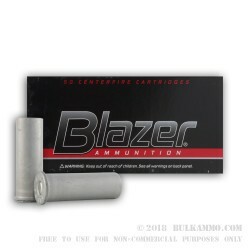 The flat-nosed projectile also leaves clean-cut holes in paper and cardboard for easier scoring and a slight advantage when it comes to Bullseye or Bianchi games where a hit might slightly cross perforation and net the shooter a higher mark. A hollow-base at the rear of the projectile facilitates slight bodily expansion when fired; this ensures that the bullet will cross cleanly into the forcing cone with even surface area contact on the barrel's rifling, resulting in stable flight and remarkable accuracy.